We welcome existing knights, dames, members and prospective members to explore our web site and learn more about the Order of Saint Lazarus organisation and the Saint Lazarus Foundation. The Hospitaller Order of Saint Lazarus of Jerusalem was a medieval military, religious and Hospitaller Order of Chivalry, and bore no resemblance to modern-day historical or charitable organizations, all using the name Saint Lazarus. It was military in that it played a military role from 1120 to about the beginning of the 16th century. Until 1291, its military activities were centered in the Holy Land helping to hold it for Christianity, while after its loss they were involved in the protection of the pilgrim routes, particularly of that to Santiago de Compostela. The military role was partly revived in the early 17th century when the Order maintained a squadron of ten frigates based at St Malo, manned by the knights, novices and chaplains. With the ending of the Order's naval activities in 1668, the military role was continued by means of its naval academy, and the ownership of a military school in Paris, which it held until the French Revolution in 1791. With regards to the religious aspect, the Order was originally an order of monks taking the triple vows of poverty, chastity and obedience. The monastic character was in no way lessened when it commenced its military role. After the Crusading period, the Order's religious character was maintained by means of its chaplains, its Religious Protector, its Spiritual Grand Prior, its rules, services and traditions. Members were expected to live their lives in the spirit of ecumenical Christian charity. The Order was Hospitaller in that its origins allegedly stem from a leper hospice founded in Jerusalem in the 4th or 5th century. According to Gautier de Sibert's 'History of the Military and Hospitaller Order of Saint Lazarus of Jerusalem', the Order was first established during the time of Saint Basil, with the founding of its first hospital in the city of Ptolemais (Acre). Other authors state that the source of the name of the Order stems from the fact that the Order was started by a group of Armenian monks who worked under the Rule of Saint Basil, and that their work was primarily to look after lepers. Due to this very contagious work, these monks were given quarters outside the walls of Jerusalem and their 'hospice' was established near to the Gate of Saint Lazarus, or, as it was referred to, the postern of Saint Lazarus. It is thus due to this geographical location that they became known as the Order of Saint Lazarus. The majority of historians, however, agree that such claims of continuity from remote antiquity was in effect an apocryphal pretension so that the Knights of Saint Lazarus pass as the oldest of all the Orders, especially since they became, in a very short time, expert Hospitallers and carers of the ill, lepers and needy. Despite its subsequent military role, it remained primarily a Hospitaller Order, operating a worldwide network of hospitals and Lazar Houses, and sending aid to wherever there was sickness and suffering, maintaining or supporting leper hospitals and Lazarettoes. In more recent times, the Order was at the forefront of manning and assisting medical centers, hospices, ambulance units and various other humanitarian institutions throughout the world. The Order was chivalric in that it became a monastic Order of Knighthood in the early 12th century. Its ranks held those who were already knights or those of noble birth who received knighthood after entry into the Order. The Order always had the power of conferring knighthood on any person deemed suitable. This ancient prerogative was enshrined in the Act of 1624, which created the category of Knights of Grace, where nobility was not required. This power, to confer knighthood remained unimpaired from the 12th century and needed no recognition for its validity, preceding, as it did, all secular knighthoods still surviving to this day. Apart from this knightly aspect of chivalry, it also implied that privilege went hand in hand with responsibility, to care for the sick and protect the weak. It was service without being servile, the use of one's effort and strength for the purpose of Christian and human charity. The Order was not a reward, but a commitment of service past, present and future, to carry out its aims, and to work for humanity in its name. Through the dedication of its knights and members, its nobility of purpose in caring for the sick, and its splendid history, the Order's traditions have survived intact throughout the centuries, and should continue so for centuries to come, as long as Christianity, and a need to help our fellow man, exists. The United Grand Priories of the Hospitaller Order of Saint Lazarus of Jerusalem are a confederation of independent Lazarite Grand Priories governed by the Supreme Grand Priory which is headquartered in Scotland, Great Britain. Unlike other similar organisations, it is assembled on an annual basis, and representatives of all the Grand Priories jointly decide on the challenges facing today’s Hospitaller works throughout the world. Since the Fons Honorum of the Order of Saint Lazarus was historically extinguished after the French Revolution by means of an official decree by the Paris Commune, the above Grand Priories do not recognize any self-appointed Grand Master or Master General. Since the main and noble aim of the Order is the carrying out of charitable and Hospitaller work throughout the world, it is the policy of the United Grand Priories to leave and assist the independent Grand Priories throughout the world in collecting and distributing funds in their respective regions without the need of burdening such noble work with the uncalled for imposition of unjustified fees. Thus, the history of the United Grand Priories of the Hospitaller Order of Saint Lazarus goes no further back than the year 1995. 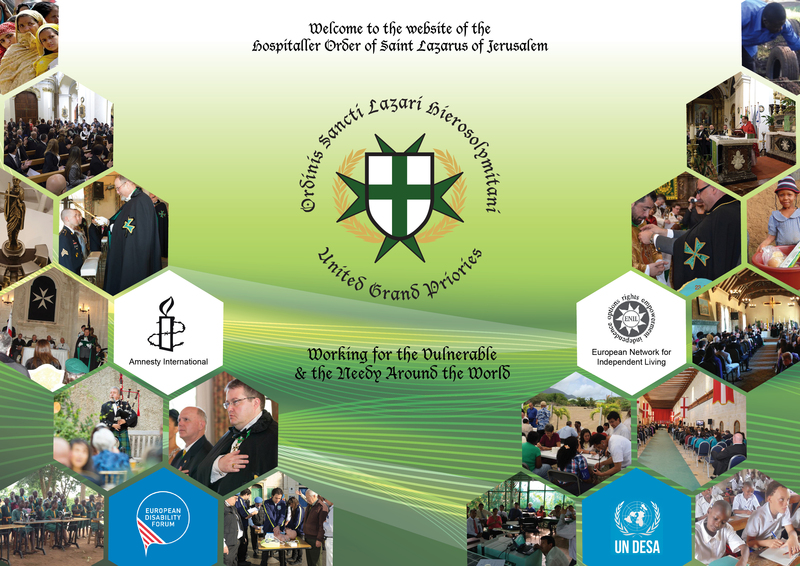 Whilst emulating the noble virtues of the extinguished medieval Order of Chivalry bearing the same name, the United Grand Priories of the Hospitaller Order of Saint Lazarus of Jerusalem projects itself according to the laws and statutes of the countries where it operates as a fully registered chivalric institution. Its primary aim is Hospitaller and philanthropic work throughout the continents. Such Hospitaller work is evident and constant in the continents of the Americas, Europe, Africa, Australasia and Asia. Although cordial rapport is encouraged with other organizations working today under the banner of Saint Lazarus, the United Grand Priories does not form part of Lazarite organizations who unfortunately continue to defy the accuracy of historical records and perpetrate the myth that the medieval Order of Saint Lazarus continued uninterrupted after the French revolution. Additionally, in 2008, the United Grand Priories of the Hospitaller Order of Saint Lazarus, by means of a unanimous vote taken by all of its Grand Priories save one, abolished the self-appointed position of ‘Master General’ of the Order which was unfortunately introduced without the proper statutory consultations. During that period in time, the expansion of the Order on an international level was indeed faced with a scenario that, for several years, the Grand Council of the Order had not been summoned and directives were solely being issued by means of individual decisions taken by the seat of the self-appointed Master – General. 1. The establishment of a Supreme Grand Priory to govern all the united Grand Priories within the Hospitaller Order of Saint Lazarus with proper and statutory representation for all Grand Priories. 2. The establishment of the Supreme Grand Prior, duly elected by the Grand Officers of the Supreme Grand Priories to preside on the work carried out by the Supreme Grand Priory. 3. The unanimous agreement within the United Grand Priories that all funds generated from specific regions by the various Saint Lazarus Commanderies, Grand Commanderies and Grand Priories will now remain available to be utilized in charitable and Hospitaller works in the region from where they were collected.